Given the degree to which AP and NWP teachers are embracing and using digital tools, it is not surprising that they are making these tools a key part of their teaching practices. In addition to desktop and laptop computers and classroom projectors, significant portions of these teachers report cell phones, digital cameras and recorders, e-readers and tablet computers being part of the learning experience. Yet they also note obstacles they face in using digital tools effectively in the classroom, ranging from time constraints to school internet filters. 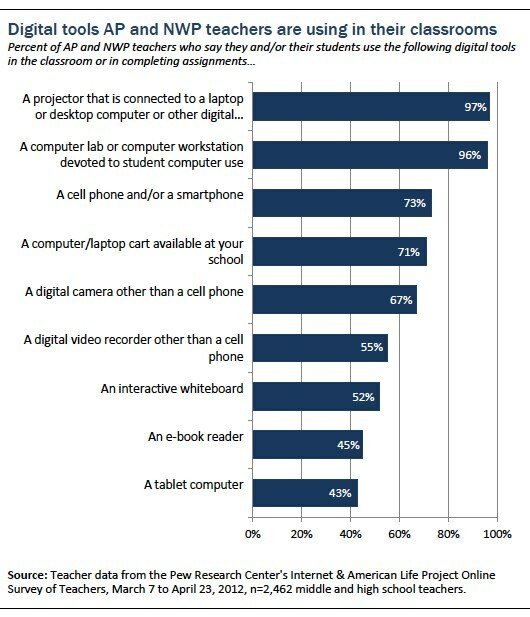 While laptop and desktop computers, and the projectors connected to them, continue to top the list of digital tools being used by teachers and students, they are now joined by cell phones and smartphones as a fairly common educational tool. Almost three-quarters of AP and NWP teachers (73%) say that they and/or their students use their mobile phones as a learning device in the classroom or to complete assignments. This is comparable to the percent who say they and their students make use of computer carts. In addition to cell phones, about two-thirds of AP and NWP teachers note that digital cameras (other than those on phones) are used in their classes, and just over half say the same is true for video recorders. Slightly fewer, but still a sizeable percentage, report that they or their students are using e-readers (45%) and tablet computers (43%) in the classroom or to complete assignments. The popularity of cell phones as an educational tool coincides with the rising popularity of cell phones among all Americans, including teens. The most recent Pew Internet report on cell phone use among 12-17 year-olds shows that as of July, 2011, 77% of 12-17 year-olds had a cell phone.8 Moreover, some 23% of all 12-17 year-olds say their cell phone is a smartphone. Smartphone ownership is highest among older teens: 31% of 14-17 year-olds have a smartphone, compared with just 8% of those ages 12-13. At that time, there were no significant differences in smartphone ownership (versus regular cell phones) by the teen’s race, ethnicity, or household income. Teens whose parents have a college education were slightly more likely than teens whose parents have a high school diploma or less to have a smartphone (26% vs. 19%). 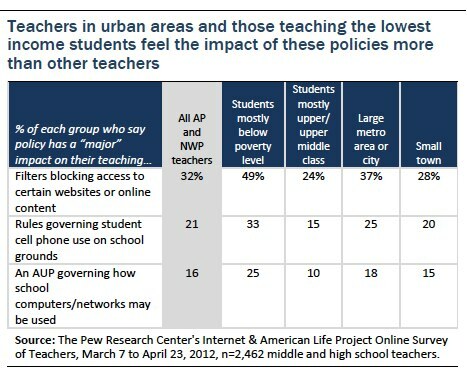 Among AP and NWP teachers, teachers of students from higher income households are more likely to report that they or their students use tablet computers and e-readers as part of the learning process. 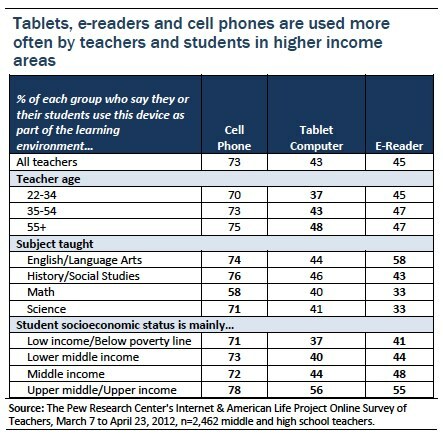 The difference is particularly pronounced in the case of tablet computers, where more than half of teachers of upper income students (56%) say these tools are used, compared with 37% of teachers of the lowest income students. The difference in e-reader use between lower income students and higher income students is also fairly pronounced, with a 14 percentage point difference between teachers of the highest and lowest income students. The use of e-readers and cell phones as a learning tool varies by the subject matter being taught. It is not surprising that English and Language Arts teachers are the most likely to report e-readers being part of the learning environment. Math teachers, in contrast, are particularly unlikely to say that they or their students use cell phones in the learning process. Topping the list of activities students engage in via the internet and digital tools is “doing research or searching for information online” which 95% of teachers say their students do and which was the focus of the first report in this series.9 Apart from finding information online, the internet and digital tools are used most often by teachers to have students access (79%) and submit (76%) assignments online. More interactive online learning activities, such as developing wikis, engaging in online discussions, and editing their own or others’ work using collaborative platforms such as GoogleDocs, are employed by fewer teachers in the sample. 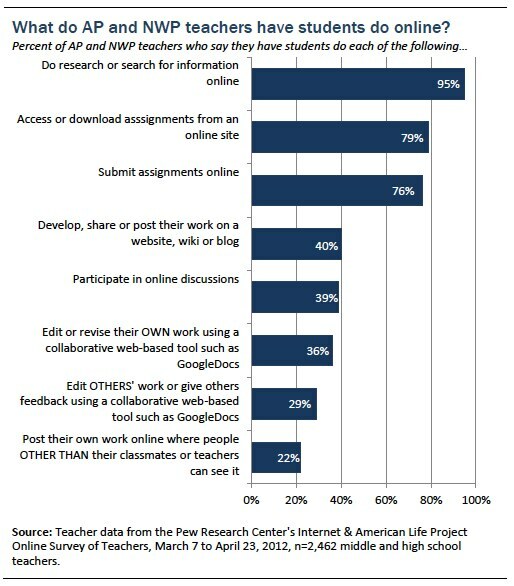 Some groups of AP and NWP teachers are more likely to employ the more collaborative online tools asked about in the survey. For instance, the youngest teachers in this group (those under age 35) are the most likely to have students develop or share work on a website, wiki or blog (45% v. 34% of teachers age 55 and older). They are also more likely than the oldest teachers to have students participate in online discussions (45% v. 32% of teachers age 55 and older) and use collaborative web-based tools such as GoogleDocs to edit work (41% v. 34% of teachers age 55 and older). Middle school teachers (those teaching grades 6-8) are the most likely to have students develop and share work on wikis, webpages or blogs. Just under half of middle school teachers (47%) have their students use these collaborative tools, compared with 41% of 9th-10th grade teachers and 35% of 11th-12th grade teachers. 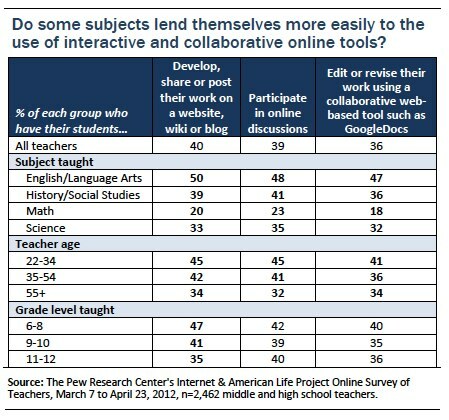 One could argue that some subjects lend themselves more easily to these types of online collaborative tools, and survey results reflect this. English teachers are the most likely to say they have students use these types of tools, often by a wide margin over teachers of other subjects. Conversely, math teachers are least likely to make use of these tools. As noted in the first report in this series, teachers noted in both the survey and focus groups how cell phones have become part of the learning experience. Asked whether their students use cell phones for any of five specific learning-related functions, the most popular was students using a cell phone “to look up information in class,” cited by 42% of the AP and NWP teachers who completed the survey. 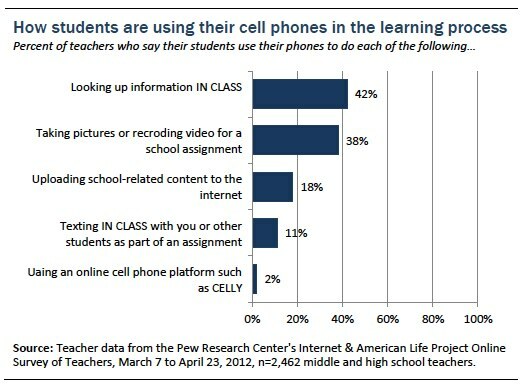 This was followed closely by students using mobile phones to “take pictures or record video to use in class assignments” (38%). The impact of cell phones is being felt less by teachers in rural areas than those teaching in urban or suburban schools. Just 28% of teachers in rural schools report students using phones to look up information in class, and fully 64% say students are not permitted to have cell phones in class. In contrast, 47% of AP and NWP teachers in urban schools say their students use cell phones to look up information in class, and just 46% say students cannot have cell phones in class. Likewise, among suburban teachers, 46% report students using cell phones to look things up in class and 45% report students not being permitted to have their phones in class. In terms of students’ socioeconomic status, teachers of upper and upper middle class students are the most likely to say their students use cell phones in class to find information. About half (52%) of these teachers report their students using cell phones this way, compared with just 35% of teachers of the lowest income students. Do cell phones and other digital tools create a distraction in the classroom? 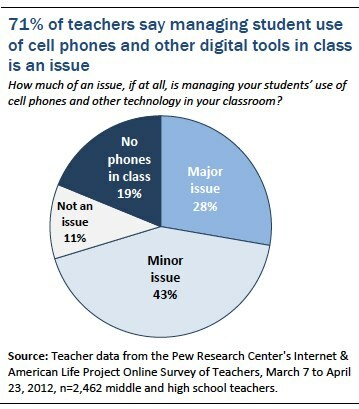 The AP and NWP teachers most likely to say that managing student cell phone use is a “major issue” are those teaching in urban areas (37%) when compared with those in rural areas (18%), smaller cities or suburbs (27%) and small towns (26%). Teachers whose students come mainly from low income homes are also slightly more likely than other teachers to describe managing student cell phone use as a “major issue” (31% say this vs. 24% of those whose students are mainly from upper income households). In addition to managing potential tech “distraction” among students, AP and NWP teachers acknowledge a variety of additional challenges to incorporating digital tools more fully into their classrooms. 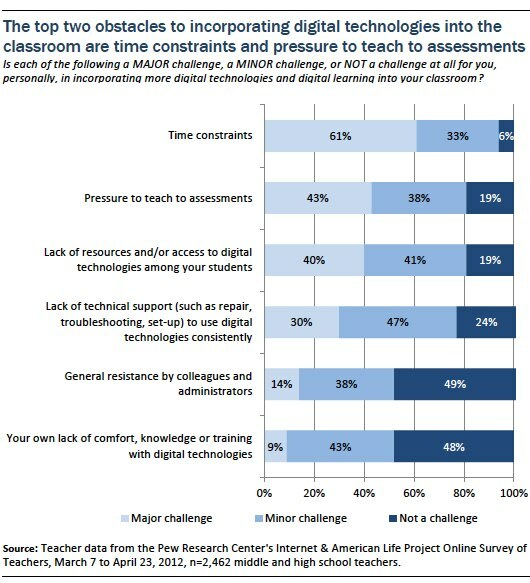 By a wide margin, the most significant challenge these teachers report facing is time constraints; fully six in 10 of these teachers say time constraints are a “major challenge” for them personally in incorporating more digital technologies and digital learning into their classrooms. Another 33% say this is a “minor challenge” for them. Second only to time is the pressure to teach to assessments. More than four in 10 AP and NWP teachers describe this as a “major challenge,” and almost as many say it is a “minor challenge.” Lack of resources and/or access to digital technologies among students and lack of technical support in the classroom rank third and fourth on the list of challenges teachers face, very close behind teaching to assessments. Much less likely to be cited as a “major challenge” are general resistance by colleagues and one’s own lack of comfort with new technologies. About half of the teachers completing the survey say each of these is “not a challenge at all” for them personally. Teachers whose students are mainly low income or living below the poverty line feel the impact of these challenges more than their colleagues who teach in more affluent areas. Teachers of the lowest income students are most likely to say that pressure to teach to assessments, a lack of resources among students, and a lack of technical support are “major challenges” to incorporating more digital tools into their teaching. 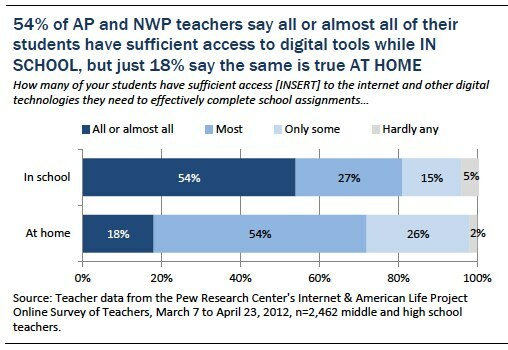 AP and NWP teachers must also contend with the wider digital divide that exists across communities and households in the U.S., and survey results indicate these teachers see disparities in access to digital tools having at least some impact on their students. Asked how many of their students have sufficient access, both at home and in school, to the digital tools they need to effectively complete school assignments, more than half of these teachers (54%) say that all or almost all of their students have sufficient access to these tools in school. However, where home access is concerned, just 18% say all or almost all of their students have access to the digital tools they need. 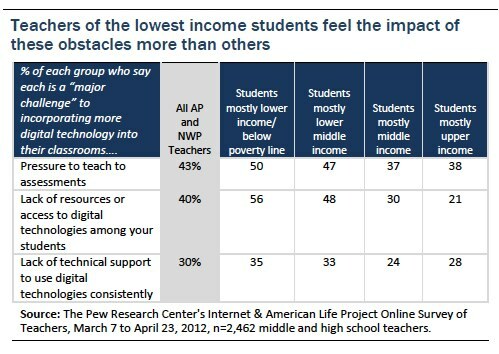 Not surprisingly, teachers of the lowest income students are the least likely to say their students have sufficient access both IN SCHOOL and AT HOME to the digital tools they need. In terms of community type, teachers in urban areas are the least likely to say their students have sufficient access to digital tools IN SCHOOL, while rural teachers are the least likely to say their students have sufficient access AT HOME. Overall, while many AP and NWP teachers express concern about growing disparities across schools and school districts, they are divided as to whether the advent of digital tools is leading to greater disparities among their students. 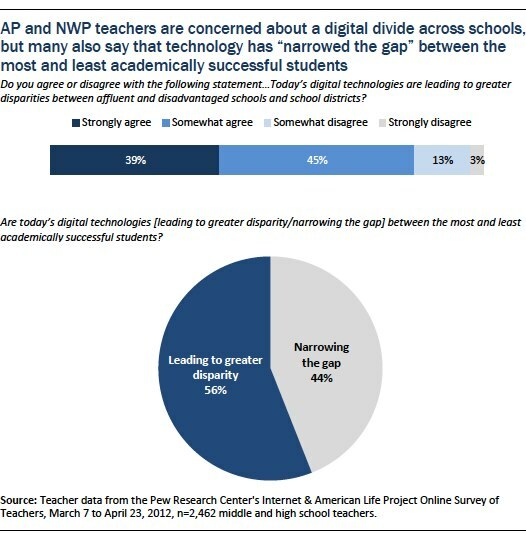 A large majority of these teachers (84%) agree to some extent with the statement that “Today’s digital technologies are leading to greater disparities between affluent and disadvantaged schools and school districts.” However, asked whether today’s digital technologies are narrowing or widening the gap between the most and least academically successful students, 44% say technology is narrowing the gap and 56% say it is widening the gap. AP and NWP teachers’ views of disparities between more affluent and disadvantaged school districts do not vary notably across different types of communities. 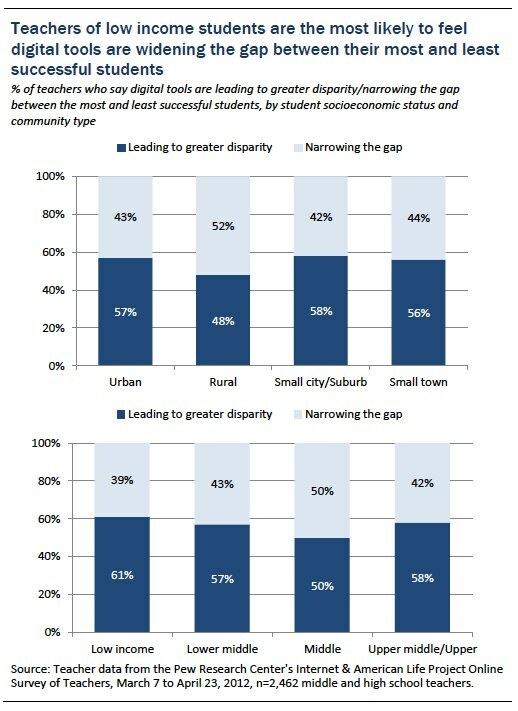 Asked whether they agree or disagree that today’s digital technologies are leading to greater disparities between affluent and disadvantaged schools and school districts, between 38% and 41% of teachers in all community types (urban, suburban, rural and small town) “strongly agree” this is the case. However, differences on this question do emerge when looking at the socioeconomic status of the students in their classes. 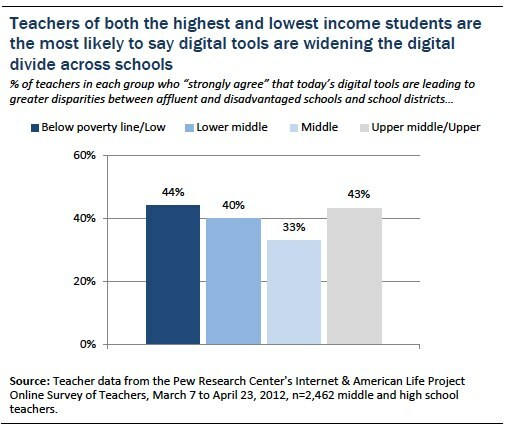 While teachers of the lowest (44%) and the highest (43%) income students are equally likely to say that digital tools are leading to greater disparity across schools, fewer teachers of middle income students (33%) say the same. Teachers working in different community types disagree slightly about the impact of digital technologies on the gap between the highest and lowest achieving students. Among teachers in urban, suburban, and small town settings, slight majorities say that digital tools are leading to greater disparities among students. Only in rural communities does a slight majority of AP and NWP teachers feel that these digital tools are narrowing that gap. Similar variation is seen on this question across those teaching lower versus higher income students. Teachers whose students are mainly low income or living below the poverty line are the most likely to see these digital tools leading to a wider gap between their highest and lowest achieving students. 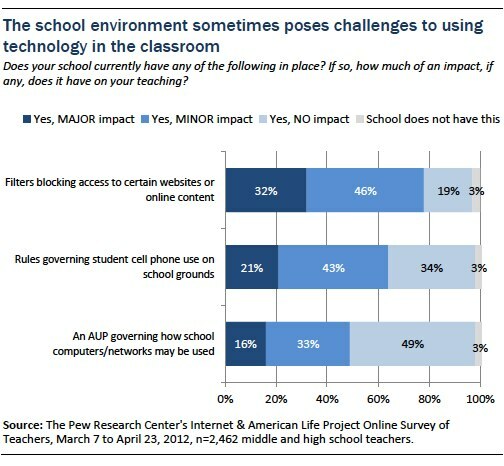 In addition to the above challenges, the survey asked teachers about three elements of the school environment that may impede their ability to use digital technologies effectively in their classrooms and assignments. These are 1) filters blocking access to particular websites or online content, 2) rules governing the use of cell phones on school grounds, and 3) their school’s acceptable use policy (AUP) governing the use of school computers and networks. Teachers were asked if their school had any of the three in place, and if so, to what extent they impact teachers’ use of digital technologies and content in their teaching. Virtually all teachers surveyed report working in a school that employs internet filters (97%), formal policies about cell phone use (97%), and AUPs (97%). The degree to which teachers feel these different policies impact their teaching varies, with internet filters cited most often as having a “major impact” on their teaching (32%). About one in five teachers (21%) describe the impact of policies regarding student cell phone use as “major.” AUPs seem to have the least impact on teachers in the study, with fully 49% saying that while their school has such policies, they have “no impact” on how they teach their students. AP and NWP teachers working in urban areas and those teaching the lowest income students are feeling the impact of these restrictions more so than those living in other community types and those teaching students from mainly upper and upper middle income households. In particular, teachers of the lowest income students are at least twice as likely as those teaching the most affluent students to report each of these policies having a “major” impact on their teaching. A common theme in focus groups was a concern about “tech use for the sake of tech use” without discernible, demonstrable added value to the learning process. While some teachers view the incorporation of the newest digital technologies into the learning process as valuable, necessary and/or inevitable, others express concern about the trend. Some noted that the prevailing assumption seems to be that incorporating more digital technologies into the learning process invariably adds value and is, in all cases, preferable to more traditional teaching methods. There was fairly widespread agreement in focus groups that new technologies should be incorporated into classrooms and schools, as long as they enhance the lesson plan and encourage learning. Some teachers expressed concern that technology is sometimes “forced upon them” for the sake of “keeping up” rather than for actually improving learning. Moreover, most AP teachers participating in focus groups said that as long as a new technology enhances learning, and does not pose excessive burdens on teachers, they enjoy incorporating it into their classrooms. Those who were not incorporating much digital technology into their classrooms at the time of the focus groups noted it was generally a product of being overwhelmed by the undertaking rather than being disinterested or not seeing benefits. This sentiment is not surprising, given that survey respondents ranked time constraints and the pressure to teach to assessments as the top challenges they face in bringing new technologies to bear on the educational process. Overall, very few teachers in focus groups expressed outright disinterest in bringing new technologies to their teaching or a belief that digital technologies have no place in the learning process. Instead, most emphasized the practical constraints in making it happen and/or a desire to make sure it is done with the best interests of the students in mind and only when it clearly improves the learning process.